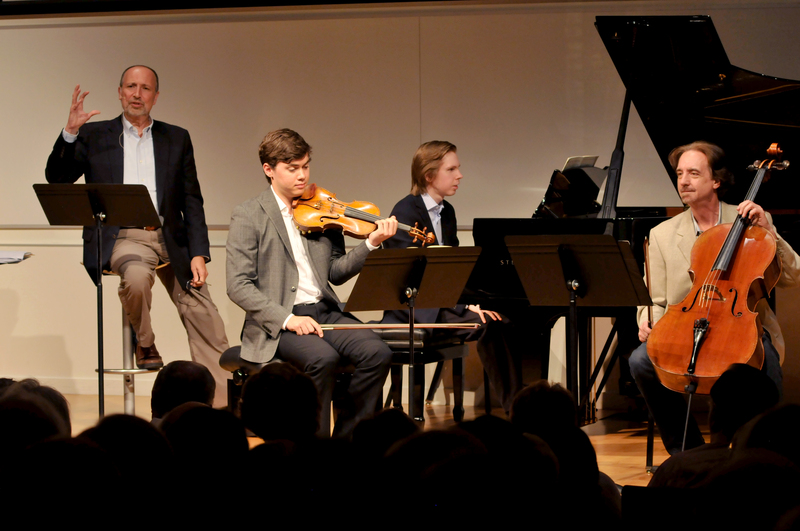 After nine successful years, Music@Menlo, the summer chamber music festival started by David Finckel and Wu Han on the San Francisco Peninsula, opened its doors last week to celebrate a milestone season. The first week included the concerts, lectures, master classes and festive events that have been a part of the festival since its earliest year. Like a dream come true, Wu Han and I arrived in San Francisco on consecutive days, from diverse and hectic summer schedules, to open Music@Menlo’s landmark tenth season. 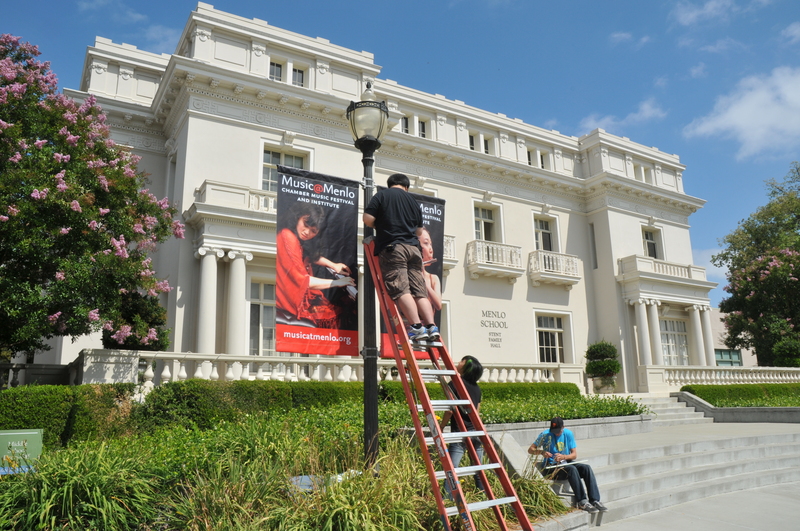 Almost everyone, except the performers and Chamber Music Institute students, had already shown up to prepare. 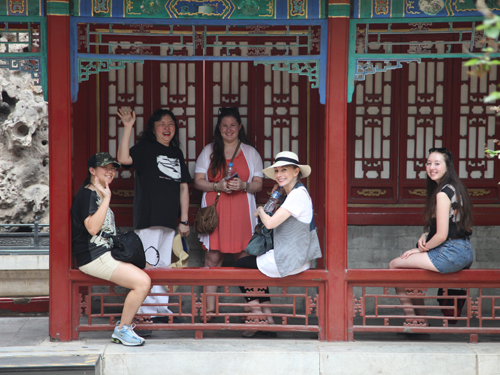 Some of the interns had been on site for nearly four weeks learning how to perform a wide range of seasonal festival tasks, from managing donor events to selling CD’s, from artist hospitality to concert production. One of our first stops – one of the most exciting every year – was to see the art of our festival visual artist displayed in Stent Family Hall, one of the festival’s most beloved concert venues and the true heart of Music@Menlo. This year’s artist is the brilliant Harvard professor Eric J. Heller, who captures actual sound waves and converts them into extraordinarily beautiful graphics. 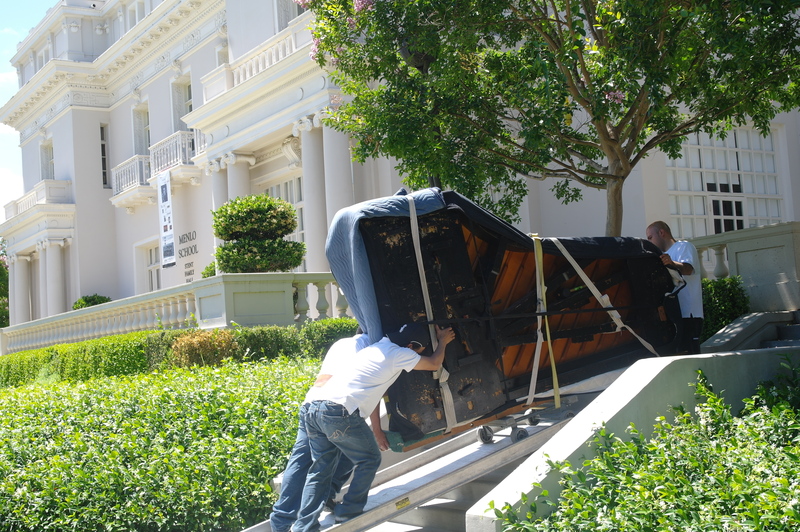 The festival’s 10-year partner, the New York based ProPiano, was on hand to deliver the dozens of pianos required for concerts and rehearsals, including three always-magnificent Hamburg 9-foot Steinway D’s, the state-of-the-art instrument preferred by artists and venues the world over. We were delighted to see our CMI faculty hard at work preparing for the imminent arrival of over forty eager young musicians. This special group of teachers, assembled from past International Performer classes, includes: Institute Director, pianist Gloria Chien; violinists Sean Lee, Kristin Lee, and Hye-Jin Kim; pianists Teresa Yu and Hyeyeon Park; and cellists Dmitri Atapine and Nicholas Canellakis. A significant addition to the Institute’s faculty structure this season is the creation of the International Performers director position, this summer occupied by no less an august musician than pianist Gilbert Kalish. 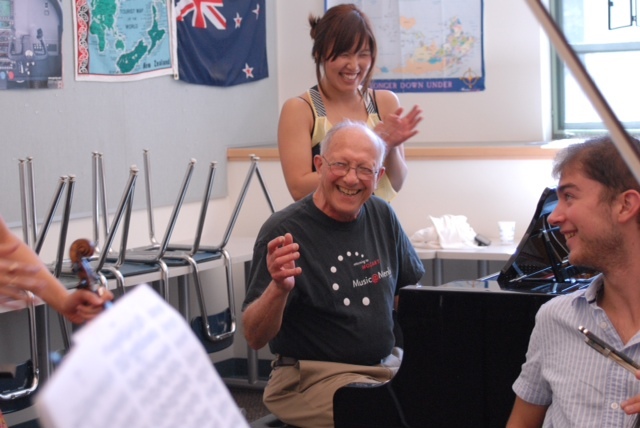 Gil remains in residence, teaching and performing, for the entire three weeks this summer, and this festival could not be luckier to have him. His vast experience as a performer and educator are matched by few in the world today. To introduce the festival and to explain the season’s theme, Resonance, we called on long-time festival friend Ara Guzelimian to present the opening Encounter on Friday evening. Our association with this deep-thinking and eloquent scholar, educator and administrator goes back many years, having known him in his many distinguished roles at the Los Angeles Philharmonic, the Aspen Music Festival, Carnegie Hall, and currently at the Juilliard School, where he is both Dean and Provost. (As such, he is my new boss, having recently joined the Juilliard cello faculty). Ara spoke movingly about the importance of great music in the world today in a two-hour presentation entitled Why Music? The events of that day, on everyone’s mind, provided the first opportunity for the topic’s relevance: the massacre in the movie theater in Colorado. Ara reminded us that when human beings commit unspeakable, inhuman acts, we all hope and reach for a sense of renewal of faith in ourselves, in society, and in each other. Music’s transformative and restorative qualities offer reassurance, emotional footing and sustenance in the most trying of times and circumstances, and Ara shared his own experience of depending on music during a time of personal crisis. As can always be expected of Ara, his Encounter was not only informative but inspirational, providing all us with a clear view of the weeks ahead, and all of the right reasons to be here in the first place. On Saturday, the festival’s annual Open House day, Wu Han and I took the stage of Martin Family Lecture Hall to be interviewed by festival Artistic Administrator Patrick Castillo, who is also celebrating his 10th consecutive year with the festival. 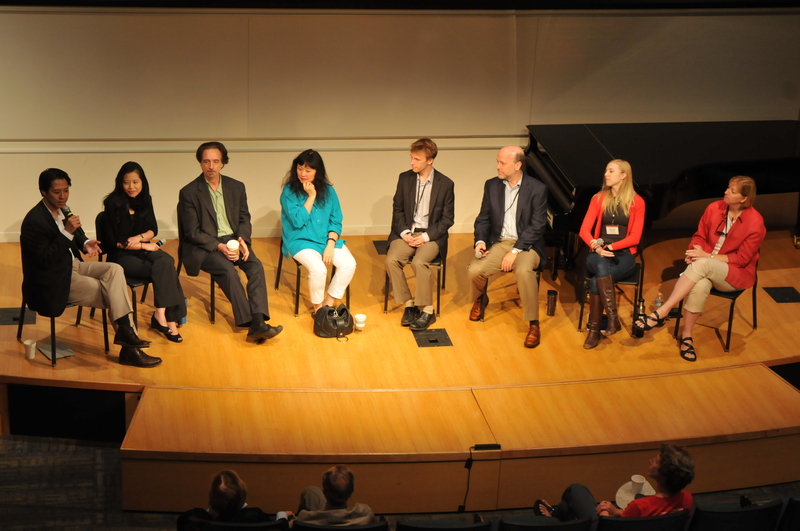 Joining us was Executive Director Edward Sweeney, Operations Director Marianne LaCrosse, pianist and Institute Director Gloria Chien, Production Manager Ellen Mezzera, Assistant Artistic Administrator Andrew Goldstein. The unusual discussion focused on the activities and role of Music@Menlo’s remarkable internship program and how it parallels the Chamber Music Institute in training the future music industry. After a quick run dress rehearsal for the evening’s concert, I returned to Menlo School where I was privileged to share the stage with Ara Guzelimian for the season’s first Café Conversation, the festival series of presentations by artists and guests on a wide variety of music-related subjects. Ara and I talked about the use of composers’ original manuscripts as keys to interpretation. We introduced the Juilliard School’s state-of-the-art web site devoted to its extensive manuscript collection, all of which is viewable online in high definition. I shared with the large audience of CMI students and Open House public photos from my recent visit to Prague (see the Bohemian Immersion blog from late May) of the manuscripts of Dvorak. The intrepid CMI International Performers joined us on stage to demonstrate the different possibilities of interpretation revealed by the manuscripts – possibilities not visible in printed editions. 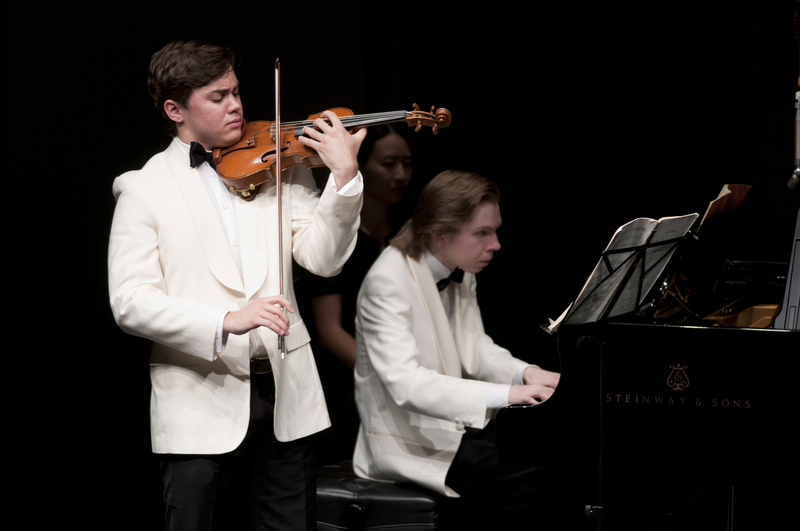 With Ara’s enticing Encounter still fresh in our memories, we were all primed for the first concert on Saturday night in Stent Family Hall on the beautiful campus of Menlo School. After a dynamic Prelude Performance by the International Performers, which included Haydn’s Lark Quartet and Dvorak’s Piano Quartet, Wu Han welcomed the eager audience to the first main stage concert of the anniversary festival. The opening of this festival has to have been one of the most extraordinary openings of any concert series ever presented. A program entitled Sustained offered music of the kind that nourishes the soul, fills basic human needs, strengthens and ennobles. One of music’s most profound, joyful and exciting works is the duo for violin and piano that Franz Schubert composed late in his life. Titled Fantasie, it is just that, with a slow, magical opening of rippling piano chords and a seemingly endless, timeless melody for the violin. The mystery gives way to a vibrant and brilliant dance, followed by a set of variations on one of Schubert’s most beloved songs, the achingly beautiful Sei mir gegrußt. After a return of the mysterious opening, the music breaks into a triumphant C major melody, and the piece concludes with unbelievable fireworks from both instruments. It is universally regarded as one of the most difficult works in classical music. 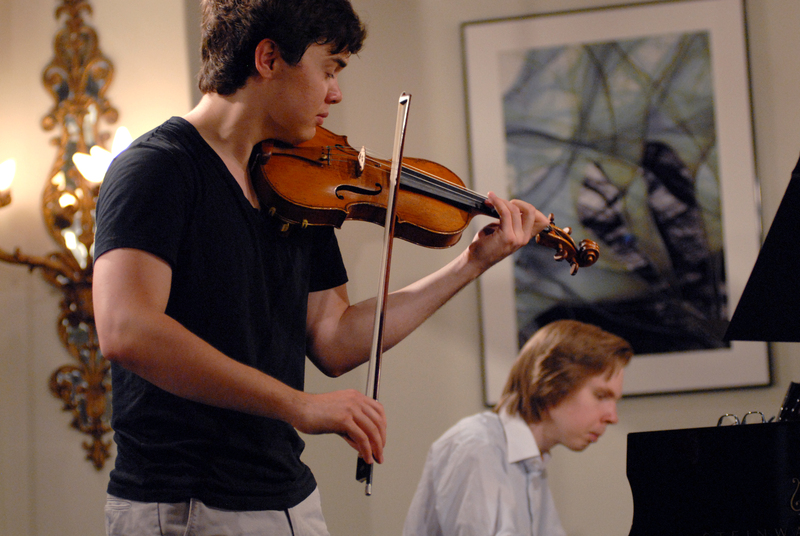 Rising to the challenge, and well beyond, was returning Finnish pianist Juho Pohjonen partnered with the young violinist – also a recent addition to the CMS Two roster, Benjamin Beilman. These two musicians, in a jaw-dropping display of virtuosity and equally sensitive musicians, brought our audience to its feet. It was their first performance of the work – neither of them had ever played it before, either together or separately. This bar-setting performance was followed by the return on stage of one of Music@Menlo’s most beloved artists: clarinetist Anthony McGill, who was not only with us in the festival’s first season but also in its one-day pilot concert in 2002. 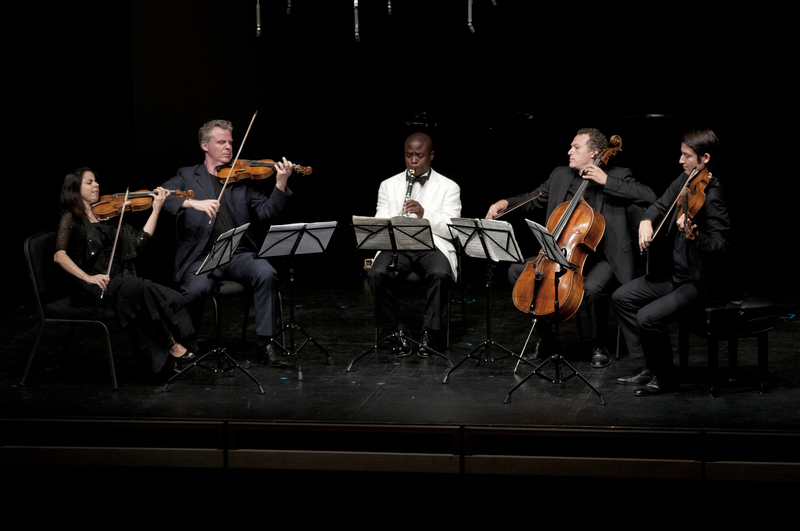 Joining him was the Pacifica Quartet, no strangers to the festival, having performed the complete Mendelssohn quartets two summers ago in the 2009 season, Being Mendelssohn. The work they played together is one of the all-time favorite pieces of chamber music, the Mozart Clarinet Quintet, well known as a “desert island” piece that many people simply cannot live without. The heavenly slow movement once again reminded us of the many reasons we began this project in the first place, as we looked over our audience in a state of profound concentration, many overcome with emotion. Having been soothed by Mozart, and entranced by Schubert, it was time to be strengthened by the composer who does that better than anyone: Ludwig van Beethoven. From him we chose his magnificent piano trio Op. 70, No. 2 in Eb, a middle-period work that combines the energy of his youth, the expansiveness of his mature style, and hints of the transcendent music of his last years. 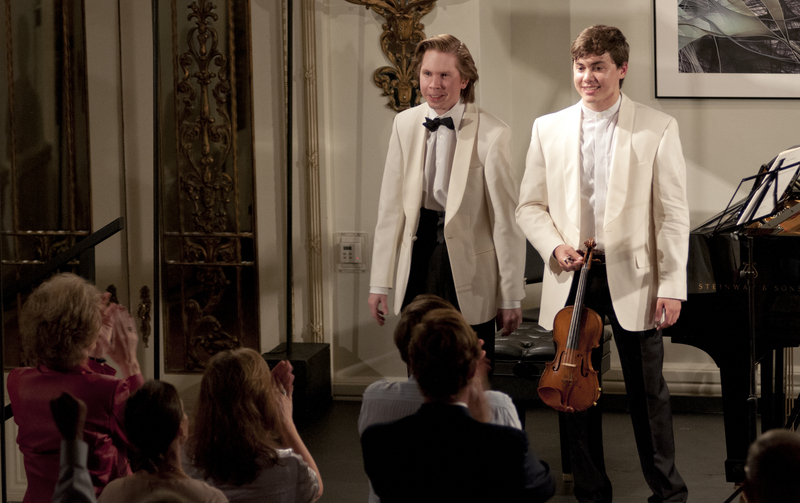 I was privileged to be the cellist joining the already-spectacular duo of Benjamin Beilman and Juho Pohjonen. 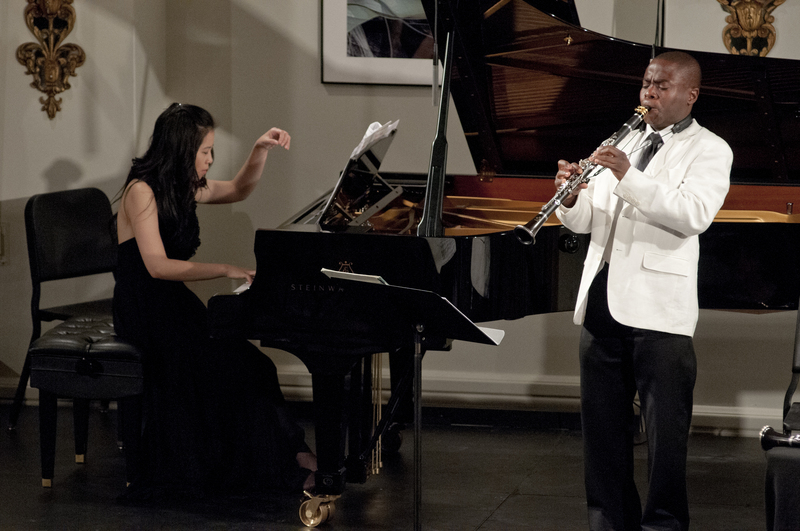 Sunday morning brought the first Carte Blanche Concert, a tour-de-force by the newly-formed duo of clarinetist Anthony McGill and pianist Gloria Chien. Over two-and-a-half hours, these indefatigable rendered flawless performances of solo and duo works, including standard literature such as the Poulenc Sonata and novelties such as transcriptions of Scriabin Preludes. 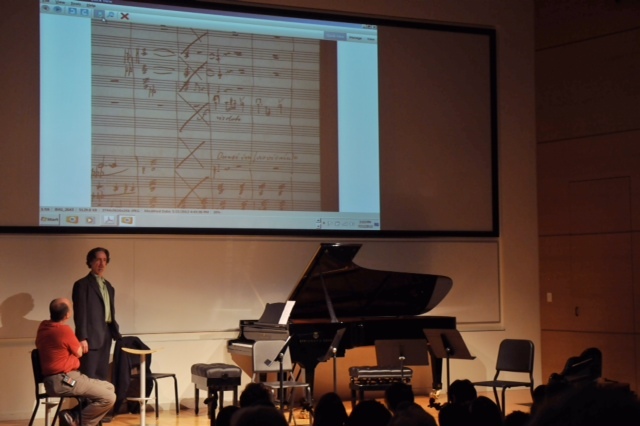 At the program’s emotional center were two extraordinary works for each player as soloist: Scriabin’s Etude for the left hand alone, performed with astounding beauty, accuracy and command by Gloria, and the movement for solo clarinet from Messiaen’s Quartet for the End of Time, played by Anthony in a performance that could only be called sonic magic. As Gilbert Kalish told me right after the concert “Anthony can do absolutely anything on the clarinet”, and he certainly proved it on Sunday, all before lunch to boot. It was easily one of the best recitals we have ever heard, and much of it will be available on record, produced by Da-Hong Seetoo. 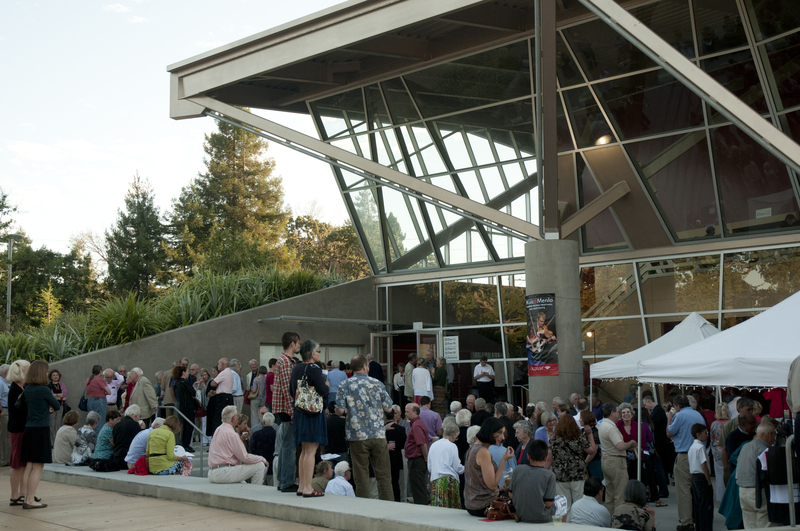 The weekend finished with another performance of Concert Program I in the Performing Arts Center at Menlo-Atherton. Stay tuned for next week’s report, appearing here next Monday. 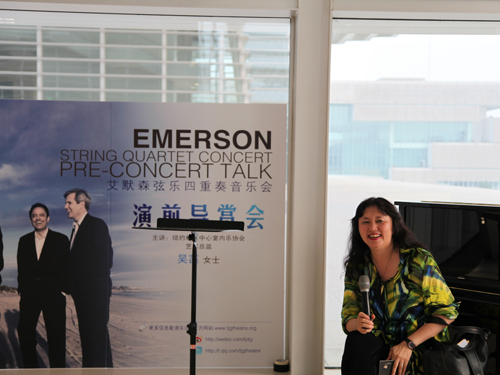 Heading to various airports on various days, the Emerson String Quartet met up for their first concert in mainland China, in the city of Shenzen. Accompanying them were family members and Emerson recording producer Da-Hong Seetoo, who helped arrange the trip in collaboration with the Chinese presenting organization, Propel. 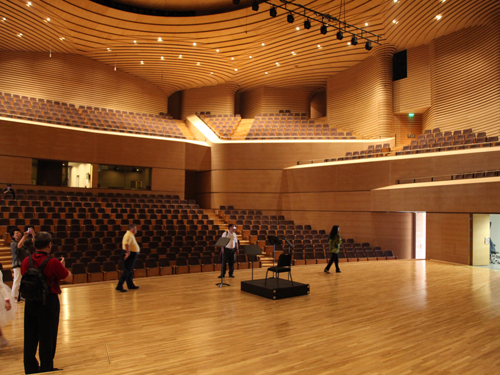 The quartet’s three appearences were in Shenzen, Tianjin, and Beijing. 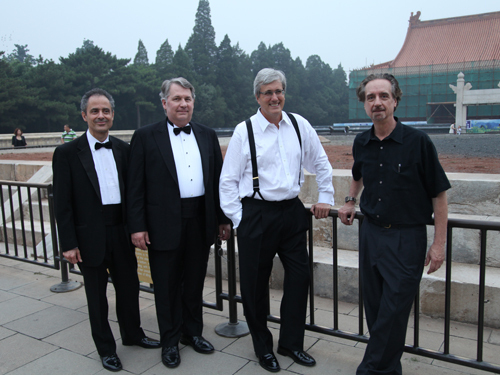 There are very few musically significant locations left in the world that the Emerson Quartet has not visited, and yet, for whatever reason, we had never played on Chinese mainland soil (excluding Hong Kong and Macau, which aren’t considered mainland). So this trip was an historic one for the quartet, and for me especially, an 11th hour opportunity to put a glaringly-missing pin on my map of Emerson worldwide appearances. 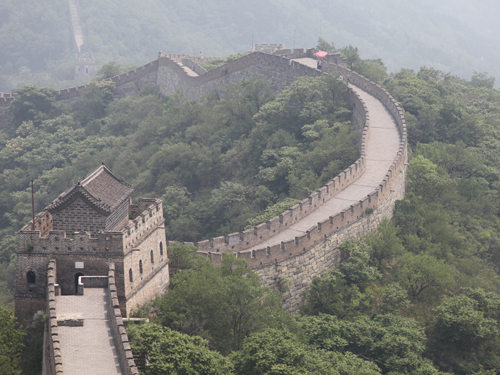 An early arrival in Beijing allowed me, Philip Setzer, and Da-Hong Seetoo, with our families, the chance to visit the Great Wall and Forbidden City on consecutive days. 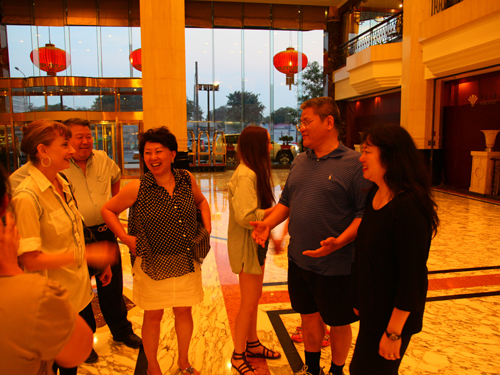 The presence of family and friends has always been a great gift on any Emerson tour, and it was especially gratifying to be able to share these extraordinary experiences with our loved ones. 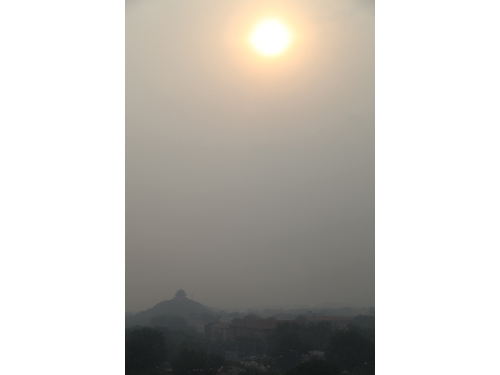 The heat hovered around 100 degrees in the daytime. 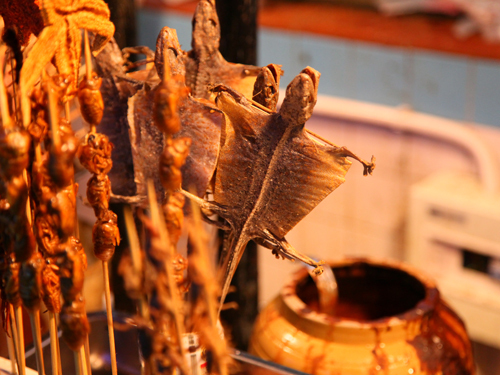 Evening was better, allowing us to visit one of China’s famous and ubiquitous attractions, a Night Market, complete with unfathomable things to eat. On Tuesday evening, after our Forbidden City tour, Wu Han and I performed at the American Embassy as representatives of Lincoln Center, at the request of Lincoln Center president, Reynold Levy. 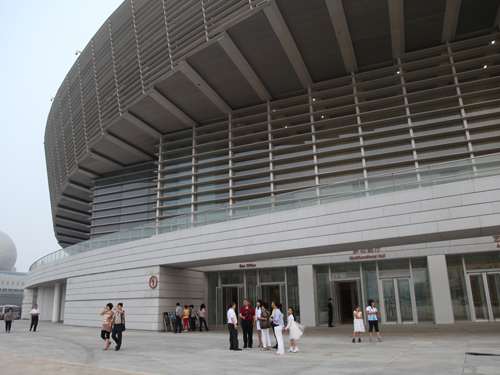 Lincoln Center’s programming and administrative expertise are helping to guide new arts centers in China. On Wednesday Philip, Da-Hong and I flew south to the city of Shenzen, which sits across the border from Hong Kong. 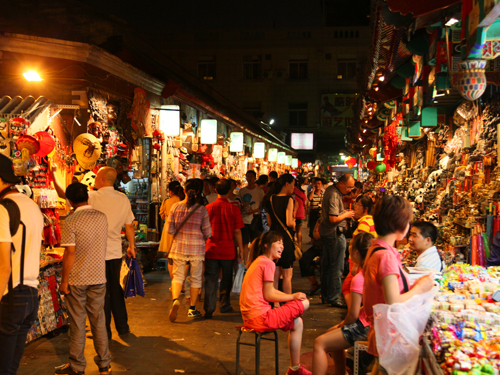 Shenzen, once a small fishing village, became, under Deng Xiaoping, China’s first special economic zone, and has expanded rapidly ever since. 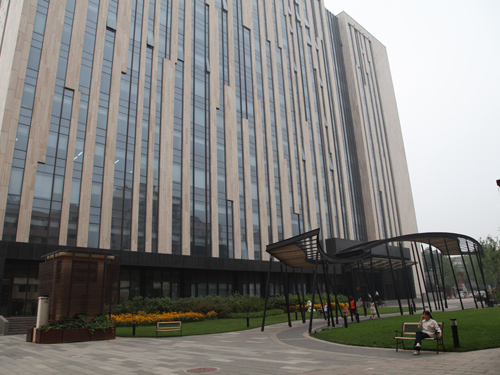 It is now one of China’s most modern cities. Being near the water (it is a thriving port) the heat was coupled with intense humidity, providing a special challenge for humans, instruments and buildings. 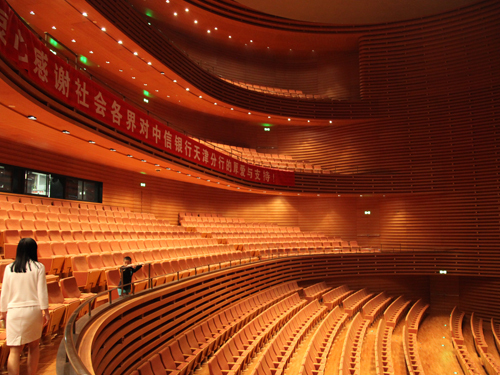 The concert, held in a large and beautiful hall, and was well attended. Da-Hong provided commentary from the stage on each of the works we performed: Mozart’s K. 575, the Shostakovich 8th Quartet, and Dvorak’s “American” Quartet. He also gamely announced the encores, darting on and off the stage as necessary. (I had prepared and practiced the encore announcements in Chinese but spared the audience my undoubtedly laughable pronunciation). After a delicious late dinner we returned to the stunning Marco Polo hotel, a gracious sponsor of the series, but not before visiting the 96th floor of a nearby skyscraper hotel, one of the tallest buildings in Asia. Thursday was a travel day from hell, as we left early only to sit on the runway for four-and-a-half hours due to bad weather. 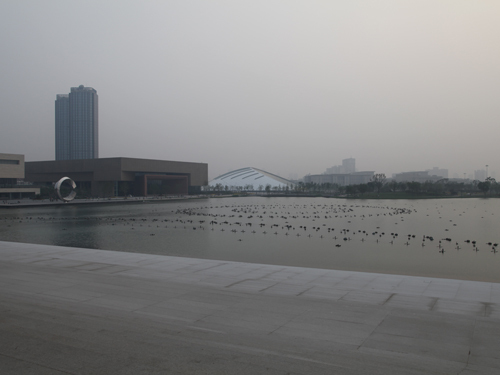 Landing in the late afternoon in Tianjin, we were rushed to the Cultural Center for a press conference and a national broadcast filming of an excerpt from our program. Darkness falling, we scrambled to a nearby restaurant for a much-welcomed meal but then had to cap the day off with a 2-and-a-half hour bus ride back to Beijing. On Friday we turned right around, boarded the bus again (this time with most of our families) and headed back to Tianjin for our concert. The Cultural Center is on a scale that I have never seen. Its size makes the Kennedy Center look almost miniature. 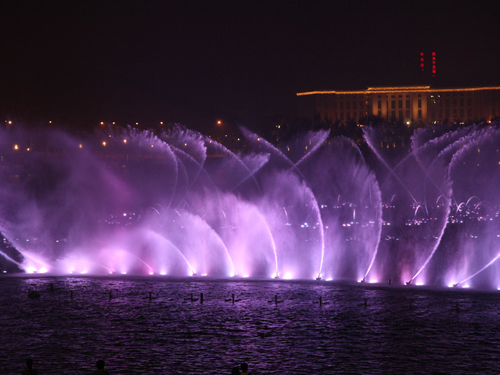 The concert hall sits on a lake the size of several football fields, and boasts a fountain which produces a phenomenal show, synchronized with music that is blasted all around the lake. For this concert, Wu Han provided a pre-concert talk (her first one in Chinese) in an adjacent room. The crowd seemed to love the concert and, as always, it is extremely gratifying to connect with and perform for an entire hall of people who have never heard us before. 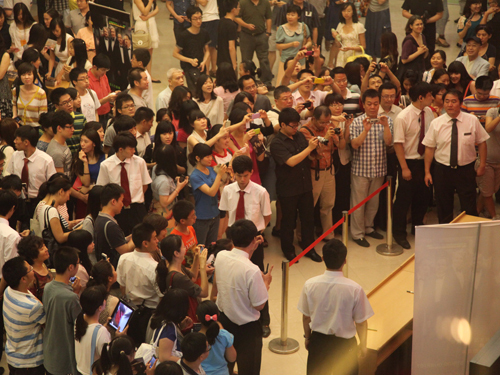 After the concert, the lobby was mobbed with people waiting for autographs on their programs and CD’s. 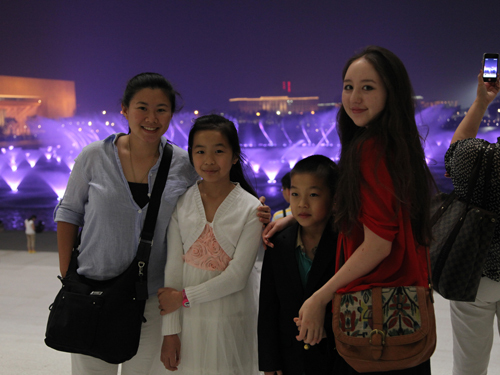 A spectacular lighted fountain show greeted us as we departed. For dinner we were treated to a famous local delicacy – a dumpling called “Go-bo-li-bao” which means roughly: “this is so delicious that even your faithful dog will leave you for it.” They were delicious indeed, and it was a special pleasure to spend a whole meal with the man who made the tour possible, cultural entrepreneur Chien Chung, director of Propel Management Company which brought us to China, and also director of programming at the Tianjin Cultural Center. 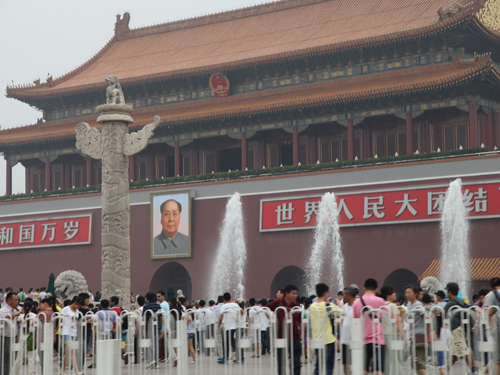 The next morning, while the rest of the crowd slept in, Wu Han and I headed for the Beijing Central Conservatory, passing famous Tianamen Square on the way. 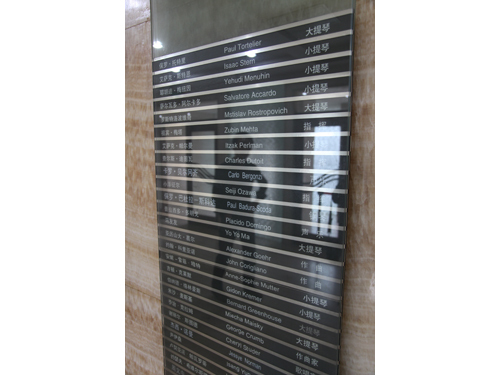 I was honored to join the distinguished list of visiting professors. 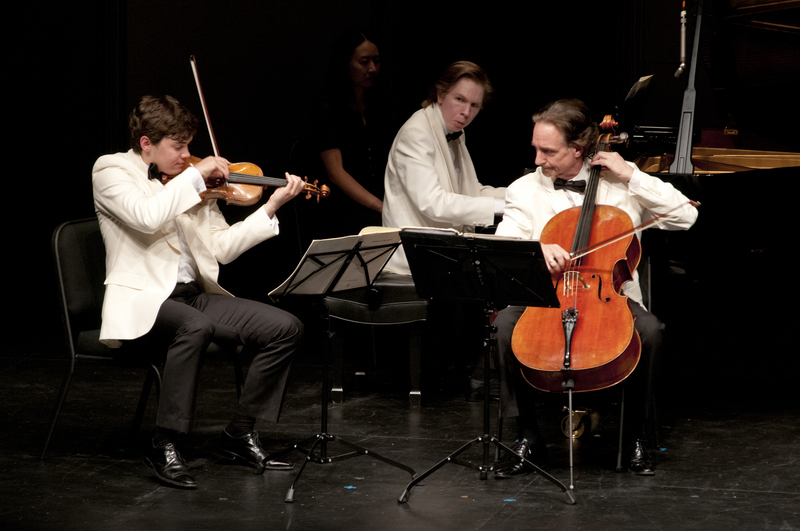 Four cellists from the pre-college division played concertos by Shostakovich, Saint-Saens, Dvorak and Davidoff. Each one was phenomenally gifted, and it was an inspirational morning. Da-Hong and Wu Han assisted with translation and some piano accompanying as needed. We were equally amazed to see the extensive buildings of the conservatory, which teaches one thousand students in its college and another thousand in its pre-college division. The building holding the practice rooms is a full fourteen stories high. 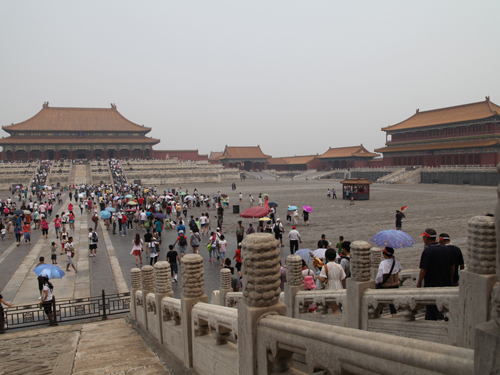 For our final concert, we were driven through massive gates and past heavy security into the very heart of China: the Forbidden City. The concert hall of the Forbidden City is a somewhat worn but glorious venue with stellar acoustics, and a distinguished history of concerts by the world’s most important musicians. It was indeed gratifying for the Emerson Quartet to finally join this list. After the concert, we experienced perhaps the largest collection of record buyers and autograph seekers ever, probably only rivaled by our recent experiences in Korea at the LG Arts Center. It was of course also very heartening to see how young our audience was, and how thrilled they were to hear and meet us. 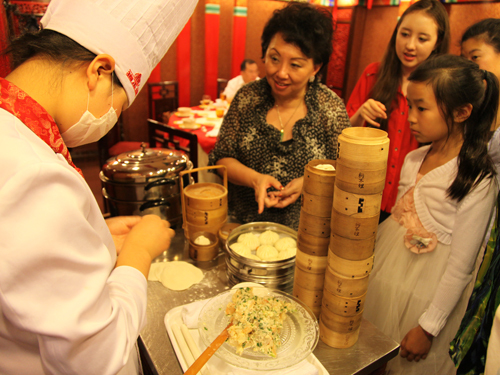 A final late dinner, surrounded by all our managers, tour guides and many invited young musicians, capped off the Emerson’s first visit to China. I am especially grateful that I had the opportunity to appear with my quartet in its debut on the mainland, and I am happy that I may have helped pave the way for many more tours for the Emerson in the future. 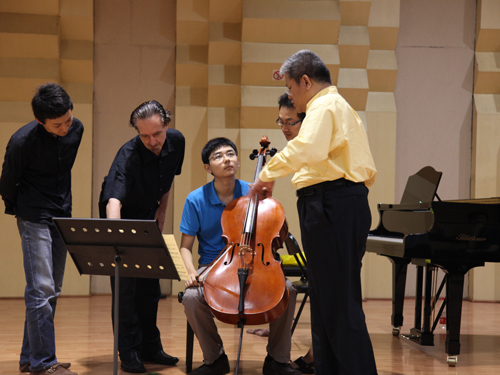 The Chinese audience, comprised of so many music lovers and young musicians, deserves to hear quartet playing on the level the Emerson will continue to provide, and undoubtedly, the quartet’s presence in China will help chamber music to take a secure foothold in this most vast and rapidly growing society.